Fruit flavoured fat free yogurt with added plant stanols. With plant stanols. Proven to lower cholesterol. Lowers cholesterol by 7-10% in 2-3 weeks. Made with live yogurt cultures. Fruity & only 53 kcal per pot. Fat free and no added sugar - contains naturally occurring sugars. No artificial flavours or preservatives. Suitable for vegetarians.Plant stanol ester has been shown to lower cholesterol. High cholesterol is a risk factor in the development of coronary heart disease. A daily intake of 1.5-2.4g plant stanols lowers cholesterol by 7-10% in 2-3 weeks. Each pot contains 0.8g so that's why 2-3 pots a day gives the effect when consumed with a main meal and as part of a healthy diet and lifestyle, including your '5 a day'. The beneficial effect is obtained with a daily intake of 1.5-3g plant stanols. More than 3g of plant stanols per day is not recommended. 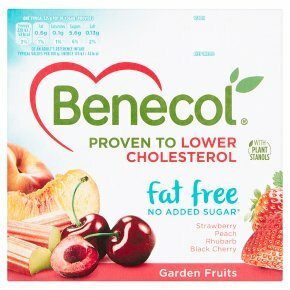 Lower your cholesterol levels with Fat Free Benecol® yogurts containing plant stanols. Enjoying 2-3 pots a day with a meal is a deliciously smart way to get more out of the healthy lifestyle choices you've already made.